The most prominent tradespersons in the whole of Grunty Fen are Miss Edwards and her nervous sister Miss Edna who preside over Grunty Fen Post Office Stores. The Post Office is also the local telephone exchange, which could explain why gossip travels fast in Grunty Fen. The shop is known for its ‘loose’: sacks of everything from tapioca to rat poison to nails to dog biscuits stand side by side to be sold by weight. Almost every aspect of rural life is catered for all year round but the shop really comes into its own at Christmas when, with the help of Dennis, Miss Edwards creates her grotto from cardboard boxes. The window display has not changed for many years because a spectacular snow scene, vividly created with hundreds of Fox’s Glacier mints, set solid and has proved immovable even with a 4lb hammer and a cold chisel. Situated behind the shop is the Moist Goods Shed in which the sisters are still discovering forgotten stock which was accumulated there many years ago when their father ran the business. Being in the fen, the shed is damp and the labels have come off the tins so Dennis has become expert in guessing the contents by shaking them. As well as the shop, there are other businesses serving the population of Grunty Fen and neighbouring villages. Oily Olly calls on Thursdays with his fish and chip van; he parks beside the village pond into which he slops his fat when he brakes too sharply. He’s famous for his battered haddock and the interesting newspapers in which he wraps it. This explains why news travels slowly in Grunty Fen. For example, Dennis didn’t hear about the moon landings until the Thursday after they’d happened, when he read about them through a layer of grease. Gladys and Len are the proprietors of the Gladlen Transport Café. Their sophisticated restaurant cuisine is widely admired by those diners who don’t mind the smell of diesel and can find their way through the stacks of pallets obstructing the entrance. Dennis and Maudie eat there on special occasions such as the annual dinner of the Goats’ Friendly Society. On one occasion Mr and Mrs South were the reluctant honoured guests. Hear how the other half live in A Private Function from the album Trouble Is. Roy Beveridge runs a butchery delivery service under the slogan ‘We Don’t Sell No Tripe’. Ernie Potts runs the Grunty Fen garage famous for ‘Potts’ Thick’, a miraculous fluid pumped from the lower depths of the petrol tank. The garage inspection pit is full of another miraculous fluid which rejuvenates machinery and metalwork. Married to Mrs Potts who collects teapots. Vinegar Potts was Ernie’s grandfather and inventor of the revolving observatory/lavatory. Her used to go door-to-door selling vinegar but soon flooded the market. Dennis tells Mr South about Vinegar Potts on the album Tiger Tales. The Lino Offcuts Man calls regularly selling odd shapes suitable for bent passages, etc. Mr Sparkle was a sad travelling cleanser salesman on an Ariel motor bike who was befriended by Gran after his wife rejected him. Dennis himself has a table beside the A10 where he sells ‘a variety of useful items’ (chiefly Bakelite doorknobs) to people who didn’t know they needed them. 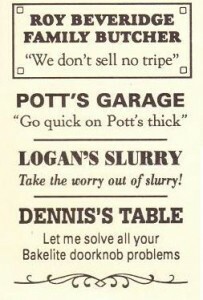 If you’d like a bookmark with the trade slogans on, please go to Dennis’s shop.